For some very flattering words from our lovely clients, take a gander over to our testimonials page. It is our privilege to photograph such kind and generous people, and to have our images gracing homes around the world. From first enquiry to our wedding day, Warren went above and beyond for me and my wife. Every one of our photos is so exceptional and absolutely perfect, and our ceremony went perfectly. Everything was organised for us, and we didn’t ever have to worry or stress about anything because of the excellent communication from Warren. If we were to get married again, we wouldn’t change a thing. See you in a year for our vow renewal! What can I say? If you want the best wedding with epic photos, seamless planning and a “nothings impossible” attitude that only years of experience can bring, then Warren is your guy. They made planning from overseas a breeze with all the hard work done. I could trust 100% in all of their recommendations meaning no time was wasted searching through endless celebrants, makeup or helicopter companies. Any worry about the weather was subsided with Warren’s somewhat spooky predictive abilities and his brilliant back up plans. Every single one of our locations were stunning including Tutoko Glacier, Earnlsaw Burn, Lake Erskine and Lake Quill. He has a natural ability to put everyone at ease and the results speak for themselves. Our photos are amazing and exactly what we wanted. 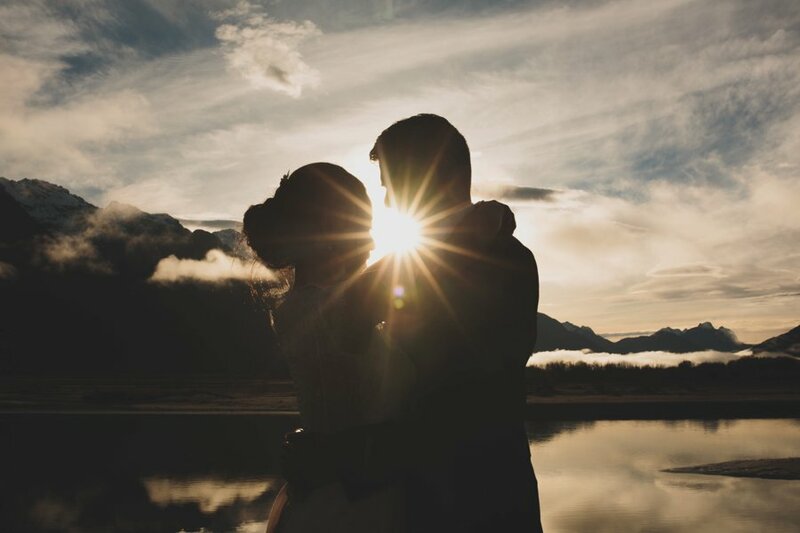 We wouldn’t hesitate to recommend Williams Photography / Mountain Weddings for your special day. Every one of your photos will be stunning and every single minute will be an amazing memory. Thank you so much! 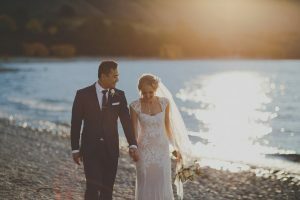 Warren photographed our wedding in Wanaka on 18 March 2017, and we cannot recommend him more highly. Warren was fantastic to work with from when we first met him (almost a year before our wedding), right up to receiving our final edited photos after our wedding. He was really responsive to all our questions, made time for numerous Skype calls and assisted with arranging a second shooter and booking our helicopter for post-ceremony photos. Warren was with us for more than 12 hours on our wedding day. He was fun and easy to have around, put everyone at ease and went out of his way to help make our wedding day special. 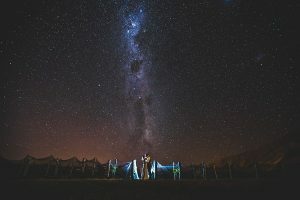 Our photos are absolutely stunning, from getting ready in the morning, through the ceremony and reception, to a final photo under the stars late in the evening. He captured so many special moments of us and our friends and family on the day. We could not be more thrilled with our photos, and had a fantastic experience working with Warren. We would recommend Williams Photography to everyone. We cannot recommend Williams Photography highly enough. 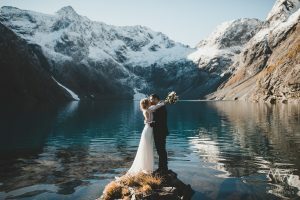 We were planning our wedding from overseas and after researching on many of the amazing wedding photographers in Queenstown we went with Warren. They were completely professional and friendly with quick email replies leading up to the wedding which was super helpful when planning an overseas wedding. On the day, Warren blended in with our group with his easy, laid back attitude. My husband is very camera shy but because of Warren’s personality, managed to be natural in front of the camera. 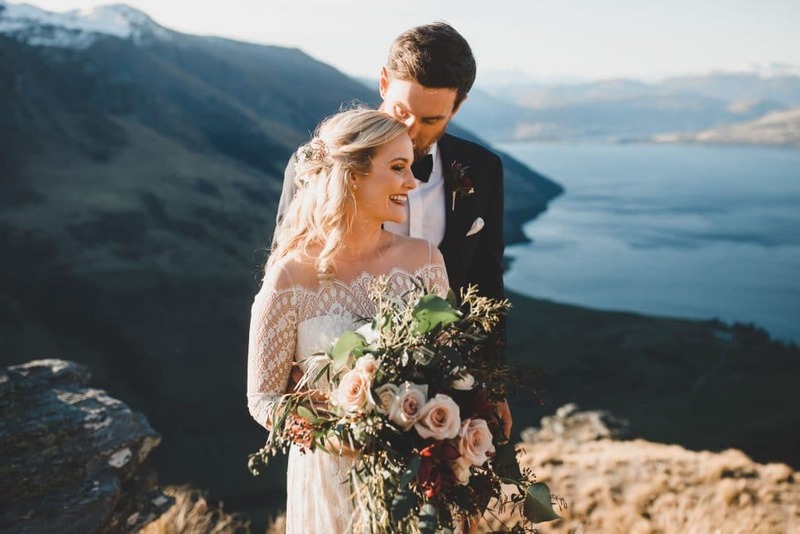 Warren has unequalled knowledge of the landscapes around Queenstown and will work with you to capture not only amazing images of the gorgeous Queenstown backdrop but also of you two as a couple. Warren spent the whole day with our wedding party and even stayed an hour later than required as we were running late with speeches at our reception. 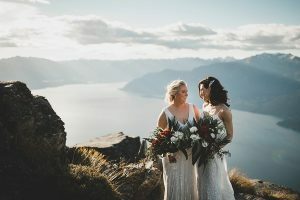 We had a couple of sneak peaks very quickly a few days after the wedding and the highlights blog which came a few weeks later was a huge hit amongst our family and friends. We’ve had endless positive comments about our wedding photographers and we can’t be more pleased with the moments they captured on the day. We cannot recommend Williams Photography highly enough! Right from our first meeting, Warren was relaxed, friendly, and professional. Ever since then the communication has been brilliant, he was fantastic at replying to emails promptly, and was great at picking up on the kind of thing we were after and running with it. We were very keen for the photos to be natural, not look staged, and to really capture the vibe of the day. He managed to do exactly that and so much more. On the day he was fantastic to have around, calm and friendly, and never at all intrusive. Most of the time we barely knew he was there! His ability to capture candid moments, and pick up on important people to capture without us even telling him was remarkable. He also has an amazing eye for beautiful shots, and particularly some of the shots of the gorgeous venue and surrounds are completely breath-taking! The few times I did see him, he was running around all over the place getting amazing sneaky shots! They were extremely prompt in getting our photos back to us, and did and incredible job in making them shine. We can’t thank Warren enough and would recommend Williams Photography to anyone!